Thank you so much for coming out to the first ever Compass Spring Fling! It was a great night and lots of fun! 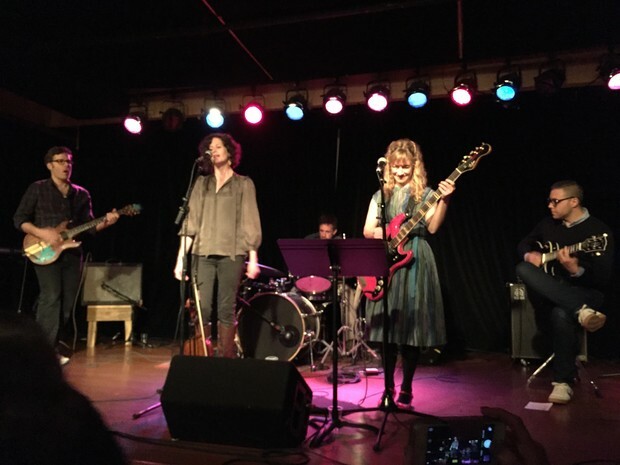 We also raised over $12,000 for the Family School Collaborative. This money will cover the remaining expenses for our arts programming and after school scholarships for this school year. Thank you to Amanda (School Psychologist), Dawn and Josh Madell (Pine Parents), Leigh Kader (Pine and Incoming K Parent) Stephanie Vanamee (Oak Parent), and Heather Maxson (Oak and Beech Parent) for planning and organizing the Spring Fling. Also, thank you so much to the Compass family musicians for providing entertainment for the evening. It was amazing! Thank you to all for participating in the first ever Compass Staff Outing Raffle. The winners were drawn today and if your child won an outing, you will be contacted this week. 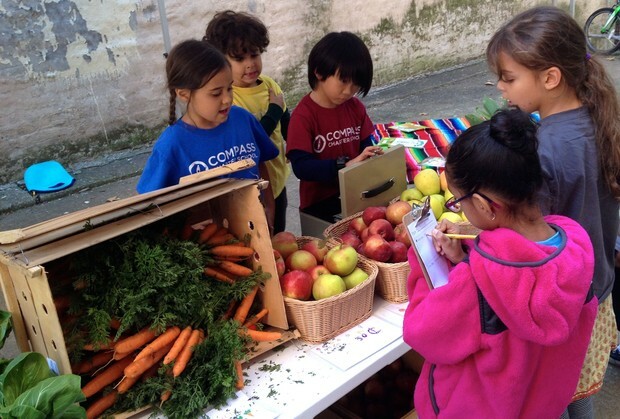 The Compass Kid-Run Farm Stand is Back for the Spring! Beginning this week, the Compass Farm Stand will be open from 11:00AM-1:00PM on Wednesdays. Please send a few dollars and a shopping bag with your child or stop by to purchase fresh produce. The first and second graders will be getting everything set up this week and are looking forward to the spring season. Kirsten will be working the the kids at the Farm Stand since Anna is out on parental leave. Please let Kirsten know if you are able to come by to help with the stand on a Wednesday. Her email is kirsten@brooklyncompass.org. Thanks! Bring your own coffee to the Meeting Room (Room 408) for an hour of conversation about our school. We invite you to submit questions and/or topics ahead of time to help guide our conversations. You may email questions directly to Brooke (brooke@brooklyncompass.org) or fill out a question form and drop it in the Inquiry Box outside the Co-Directors' Office. The purpose of these conversations is to provide a space for parents and the Co-Directors to engage in purposeful dialogue surrounding our progressive, inquiry-based approach to education. We hope you will join us as often as your schedule allows. And, as always, please remember that our doors are always open. If you have immediate questions or concerns, please reach out to set up a meeting. Below are a few articles we have read recently and found interesting. Please feel free to send articles that you think the parent community would be interested in reading and they will be included in future updates. 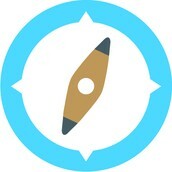 Articles can be sent to Brooke (brooke@brooklyncompass.org). Thanks! Thank you to the families who have already contributed to our Healthy School Fund (formerly called the Student Activity Fee). Please see the info below. The cost of our snack service along with a laundry service for our reusable rags and towels, and biannual lice checks is approximately $15-$20 a month per child. We kindly ask that you contribute to our Healthy School Fund/Student Activity Fund on a monthly or yearly basis. Please contribute what you can. If you are unable to contribute at this time, please let us know and we will support you. Your child will not be excluded. If you are able to sponsor another child for a month or the entire school year, it would be greatly appreciated. Thanks! Electronic Way to Send Money: Thanks to a recommendation from two parents, we have found a free and easy way to transfer money from one account to another. We want to make it easy for you to make monthly payments for snacks, future t-shirt purchases, and whatever other costs that may come up. The application is similar to Paypal, only free and easier to use. It is called Square Cash (click on the left side of the webpage for a short video on how it works and enter your cell phone on the right to get a text giving you $1 and a link to get started). After you get the text, all you need to do is enter your debit card information, download the app and type your email address. You are now ready to make and receive payments. To send Compass money, press "Send", select an amount and send the money to Todd's email address (todd@brooklyncompass.org). "Cash" also allows you to receive money from others as well. It is an easy for you to pay a babysitter or for a friend to pay you back some money they owe you. If you would like to know how you can set up a recurring, monthly payment from your Citibank or Chase account, email Todd. Non-electronic way to contribute to our Healthy School Fund: If you are not able to use Square Cash or are not comfortable using an electronic system, please send cash or a check (Made to Compass Charter School) in an envelope with your child's name and Healthy School Fund on the front. When using Square Cash or a check, please write "Healthy School Fund" in the memo for our record keeping purposes. 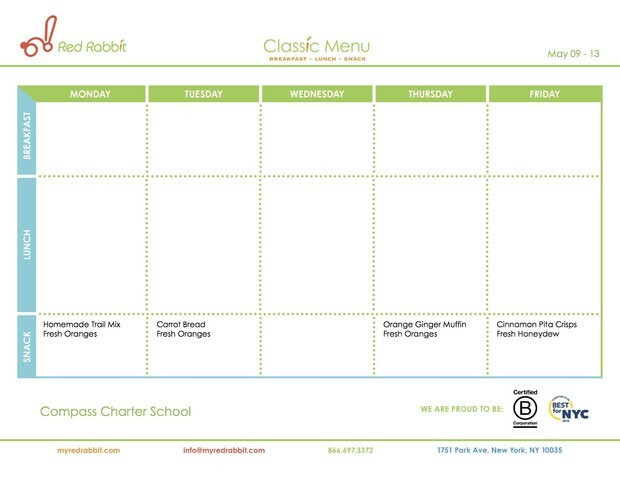 This week's snack menu is below. Children with food allergies receive a different snack that is packaged separately from other foods. We do not serve food with nuts, but some of our snacks have gluten and/or dairy and alternatives are offered to children with allergies and sensitivities. We offer breakfast to all children who arrive on the school bus or are dropped off before 7:45am. Breakfast is free to all NYC school children. You may choose to send a lunch from home or have your child eat school lunch. School lunch is free for children who qualify for free or reduced price lunch and costs $1.75. You do not need to inform us that your child will be eating school lunch. We charge families on a periodic basis throughout the school year. Feel free to reach out anytime with questions or to catch up. Our contact info is listed below.